Social media has taken the wedding world by storm. Wedding vendors are now reaching out to potential clients through mediums such as Instagram, Facebook, Twitter and Pinterest while brides are creating wedding day wish lists of ideas and sharing them with other brides-to-be. This increased use of social media for wedding idea sharing has definitely raised the bar for uniquely personalized celebrations. Although most guests will understand your desire for a more private celebration, you can’t expect everyone to know your preference. For that reason, we’ve put together a set of wedding social media guidelines for you to consider. Decide how much of a role social media will play in your celebration beforehand and share these guidelines with your guests before the big day. This seems like common knowledge, but some people still neglect privacy settings on their accounts. Restricting friends from publicly tagging you in photos is the easiest way to prevent any unflattering or private photos from blowing up your news feed. Change your settings so that your tagged photos are private. That way the intimate details of your wedding will be available for you to review before they become public. After your wedding, if you want to share certain photos only, individually change the settings of the photos you like. If you would like your guests to participate in the celebration, rather than spend time adding filters to photos or tweeting, add your wishes to your wedding website, make a note in your program or have someone kindly announce prior to the celebration that guests should put their cell phones away during the ceremony. At the very least, it will allow your friends and family to share in the moment you and your groom will cherish the most. Create a photo sharing account. If it is important for you to have every moment of your celebration documented by your guests, give them an appropriate medium through which they can share their photos. Create a Facebook page or Instagram hashtag for photo sharing. You can also look into apps like WedPics, which allow you to invite your guests to upload their photos and videos of the big day into an album that you can manage. Photo sharing accounts are a great way to consolidate all of the pictures from your wedding from multiple points of views. You may be surprised by the candid shots some of your guests take during the evening. Flashes from devices such as camera phones can be distracting and can also cast harsh lighting on your professional wedding photographer’s perfectly lit shots of important moments like your first kiss. 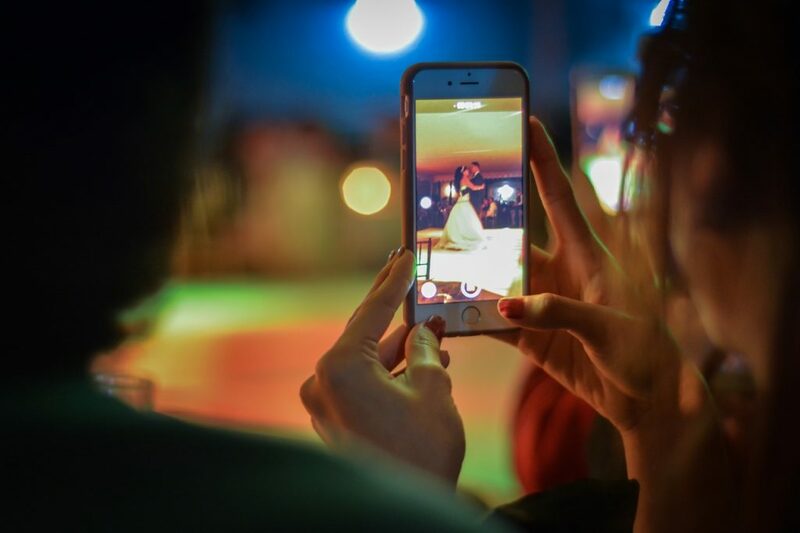 If you decide to allow your guests to take photos during your ceremony be sure to ask your officiant to remind everyone to turn off their flashes along with their phone ringers once the ceremony is about to get underway. The most important tip for managing social media during your wedding day is to keep your calm and be understanding. Your guests want to celebrate with you, and most of them will want to remember how great the day is, so photo sharing is inevitable. Setting social media guidelines with tact and genuine kindness will leave a good impression on your guests that will set the tone for an enjoyable evening.